The chapter is concerned with the mobile technology and its interventions on the perception of the body and the space, demanding new behavioural codes and evoking other communication patterns. This technology enables users to be always connected, creating other practices of sociability and composing the urban landscape and the body space with digital contexts. So, the space occupied by mobile users is no longer physical or virtual, but hybrid. After a brief introduction about hybrid spaces, some theoretical references configure the idea that mobile technology determines specific modes of interaction, emphasising a ritual dimension. The mobile users have started to perform the same body gestures and bounded intimacies in a social context that configure a specific new bodily spatiality. Some artistic projects will be presented pointing out some aspects of significant social mobile uses, transforming users bodily states and spatial domains. The computer as a communication tool has transformed the means of human interaction profoundly, providing a social space that has been individually and/or collectively explored, accessed, and developed through different devices. The computing technologies and networks have effectively contaminated the physical space. To understand the materiality and effect of mobile devices on everyday life is the main concern of this text. The mobile technology enables users to be always connected, helping them to create other practices of sociability, composing the urban landscape and the body space with informational spaces. This process has transformed the comprehension of the communication space, that it is no longer physical nor virtual, but an emerging dynamic configuration of different spatial matrices – distinct dimensions organised by cultural, economic, social and technological elements. The space is no more determined by the physical contiguity, and according to Castells (1999) it is the space of flux, a circulation space, not any more restrict to geographical frontiers. For Manovich (2005: 3) “cellspace is an invisible layer of information which is overlaid over the physical space and which is customized by an individual user”. According to Hayles as cited by De Souza e Silva (2004: 135) “the context is becoming enfolded, so that there is no longer a homogeneous context for a given spatial area, but rather pockets of different contexts in it.” A hybrid space, thus, is not only related to the layering of digital data on physical reality; it is a conceptual space created by the merging of the borders between the physical and the digital space due to the use of mobile technologies (De Souza e Silva, 2004). Then, the hybrid space can become local, not only thorough geographical inputs, but every time someone actualizes any live communication activity, such as MSN, twitter, email, on the web; it can be understood as a process of virtualization, making emerge distinct realities in real time. 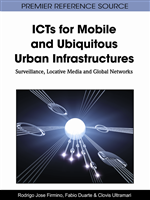 According to Santaella (2007: 224), the “interstitial space” is another term that comprehends users actions combining urban spaces and digital contexts through mobile technologies. Lemos (2010: 4) affirms that “place is now the result of a set of physical, cultural and economic characteristics: physical dimensions and a database”. These configurations have enabled a dynamic perspective of our interactions, combining face-to-face and mediated relationships through synchronous and asynchronous exchanges.